"Some of the features players can experience in the game are building and designing culture-inspired houses, owning exotic islands, throwing parties, performing a range of cool actions, adopting unique pets, wearing clothes from different countries, meeting famous people from the past and present and visiting famous landmarks around the world." A Strong Story-line – The Travels of Wiglington and Wenks is one of the few virtual worlds with a rich story background. Children inside the virtual world will be immersed in a story-driven environment. So they are not simply logging in to play a game or just chat - they're participating in a story. Immersive Learning – Immersive learning forms the backbone of The Travels of Wiglington and Wenks Virtual World. The virtual world features famous landmarks, historical people, inventions, culture, nature and wildlife. Vital knowledge is presented in creative ways that will attract and motivate kids to learn as they play. 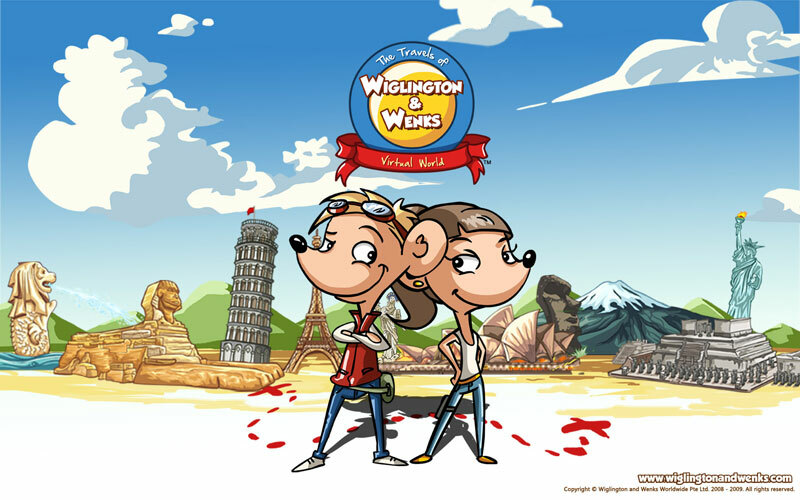 Environment – From global warming to forest preservation to the protection of marine life and endangered animals, The Travels of Wiglington and Wenks helps children understand the environmental problems our planet is facing. It also introduces to them little and simple ways by which they can help nature’s cause. Cultures – Children will be experiencing different cultures and making friends with other kids from a rich variety of backgrounds from all over the world. Safety – The Travels of Wiglington and Wenks sees protecting children from bad influences on the internet as of paramount importance. For this purpose, we have developed a set of proprietary safety features. Getting Prepared for the Future – There is an urgent need for creativity among the young to help deal with the now truly pressing problems of the next fifty years - climate, over-population, globalization of communication and movement but still huge imbalance of wealth, ownership of worlds assets, fully artificial brains within ten years, robotics to compete with the human body within twenty years, exponential learning leading us to totally unknown places, dwindling relevance of the money system, etc. We are not saying that The Travels of Wiglington and Wenks would equip children with all the creativity to deal with these problems, but it is a product built upon the belief that creativity amongst the young is the new survival kit and the creativity our virtual world allows will inch them a tiny step closer to that ideal. It's fun! – From the start, The Travels of Wiglington and Wenks was designed to be fun. For parents, the points above are of incredible value. For children, they just want to have fun online - and that's what the virtual world will deliver.